HERE WeGo vs Google Maps. Two maps apps with the potential to help you find the fastest and easiest route to your destination. HERE WeGo previously called Here Maps previously owned by former mobile phones reader company Nokia and right now owned by multiple companies including BMW and Audi, and Google Maps by leader search engine Google. Which app will get the glory to the ultimate navigational app? 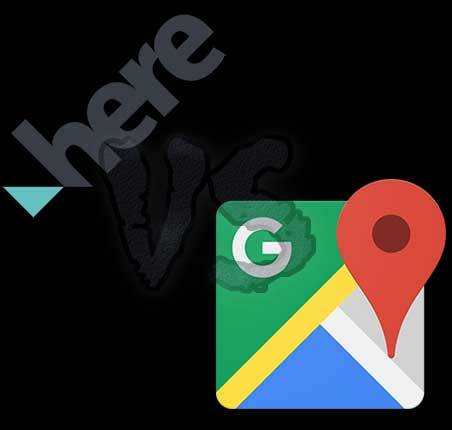 Let’s find out in this HERE WeGo vs Google Maps comparison. Regarding the interface, both maps apps are different. HERE WeGo uses dark Pink colour to show the major roads which look very good in satellite mode while Google Maps uses the Gray colour to identify important roads which don’t make an excellent impression in satellite mode but it looks detailed on the navigational mode. Both have the search bar on the top and options bar at the top left corner. Modes button is also on the top while the current location button in on the bottom left on HERE WeGo and bottom right on Google Maps. Google Maps have a benefit of a microphone with the search bar and some options at the bottom. At the same zoom level, Google Maps did an excellent job showing the roads’ names while HERE WeGo did not show the close ones but the roads which were a bit further. Score: HERE WeGo: 1, Google Maps: 1. Both are well made regarding the interface, so both get one point. In the experiment, I put about 30 minutes far journey, and both showed a little bit different path with a couple of alternate routes. Regarding the routing in HERE WeGo vs Google Maps, both maps perform well because depending on the time and traffic both maps can give you a long route. I’m using both for quite a while, and sometime HERE WeGo works better than Google Maps. There was a difference of four minutes in arrival time, and Google Maps was a clear winner. For routing, I’ll go with Google Maps because the journey was a kilometre shorter than HERE WeGo. Score: HERE WeGo: 1, Google Maps: 2. Well, Google Maps perform better, but HERE WeGo also does a great job. Both apps use satellite technology to bring you the latest traffic updates. Google Maps uses an intelligent AI to find the perfect route to the destination while HERE WeGo also uses AI and the positive thing about HERE WeGo is it warns you about speed and red light cameras. HERE WeGo has another feature which Google Maps does not have is real-time vehicle speed and the speed zone limit. Both apps support a wide range of navigational languages. The other best feature I noticed in HERE WeGo is I could see on-going projects. While browsing the maps, I saw that an under construction highway was on the map showing in a dash-dotted line. Score: HERE WeGo: 2, Google Maps: 2. HERE WeGo is better than Google Maps concerning reporting and updating. In the comparison of HERE WeGo vs Google Maps, I put the same address as in the driving mode. The results were different. The left one showed a bit of the walk and then a bus and then another bus from the city while Google Maps also showed walk and a bus change. 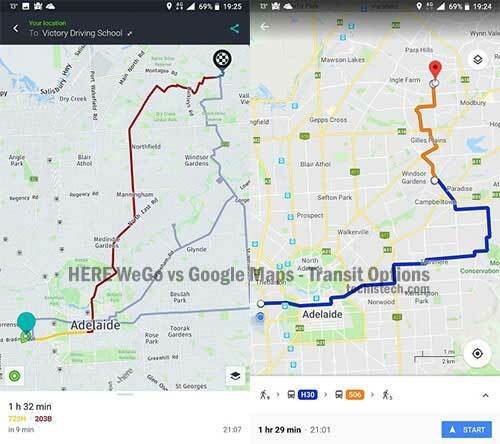 HERE WeGo showed a journey of an hour and thirty-two minutes while Google Maps showed the route of an hour and twenty-nine minutes. HERE WeGo informed to leave at 07:34 pm, and arriving time was 09:07 pm. On the other hand, Google Maps advised to leave at 07:32 pm and arrival time was 09:02 pm. Score: HERE WeGo: 3, Google Maps: 3. The above results are slightly different so none will be considered as the winner. Also check out: Sygic vs Google Maps or SwiftKey vs Gboard. Both apps support offline mapping, and the procedure is a bit different. With HERE WeGo we can download from a region to the entire country, and whenever an update is available, we get a notification. While on Google Maps we also can download the specific area but the negative thing about Google Maps is the offline maps expire very quickly, and we must update them to use them whenever we are offline. With Google Maps we can’t get the public transport option while we are offline, but in HERE WeGo we can see the public transportation information which of course will not be as stable as the online ones. Both apps showed the shortest path to the destination when the connection isn’t available. Score: HERE WeGo: 4, Google Maps: 3. Sorry Google Maps, but HERE WeGo has an extra feature to show public transport even the internet connection isn’t available. Well, I must say Google Maps is a clear winner concerning the information. Both are available in over 200 countries, but HERE WeGo is not fully updated in some of the nations. Google Maps has gone way far ahead to add the business addresses on the map, and even in smaller countries where maps are no used, you will find the information about roads and shops. HERE WeGo, on the other hand, has still much to cover because in the countries like India, Pakistan, Bangladesh etc. the information about roads and shops is missing. In villages where Google Maps doesn’t know about the name of a street or a road, it does show that there is a road which connects to other routes. HERE WeGo misses lots of information even about roads. Score: HERE WeGo: 4, Google Maps: 4. Well, Google Maps is back in the game because of containing the information of millions of shops, roads, and streets around the globe. Regarding security, both apps do not use any features. If we talk about other apps then Waze uses a security feature to prevent typing while the vehicle is in driving condition. Google Maps and HERE WeGo do not come with any built-in security feature to protect the user. Both are great maps apps used by a wide range of people and brands. 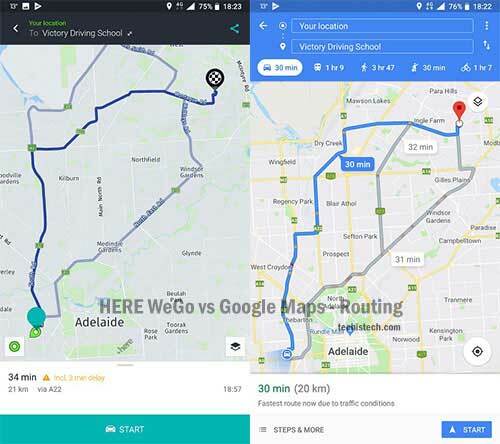 HERE WeGo is new in some of the features while it has pretty unique features as compared to Google Maps. If we compare Waze vs. HERE WeGo, we will be able to see a real clash because Waze is also a fantastic maps app from Google. Meanwhile, check out the comparison Waze vs Google Maps here. No doubt, both apps are great. HERE WeGo has much improved in the last few years and the features like vehicle speed, red-light and speed camera reporting etc. have made this app one of the most used navigational apps around the globe. Google Maps is a mapping app available in more countries than HERE WeGo. I hope the comparison HERE WeGo vs Google Maps helped. Feel free to add something to this post using the comments box below. Important information: Names and images used in this article are copyright material from respected companies. We do not own the copyright for any of the photos used in this article. Next Article HERE WeGo vs Waze – Which One Should You Choose in 2019?